We are officially in a new age. With the rise of virtual reality back in 2012, we knew that Samsung would eventually step up to the plate with something. 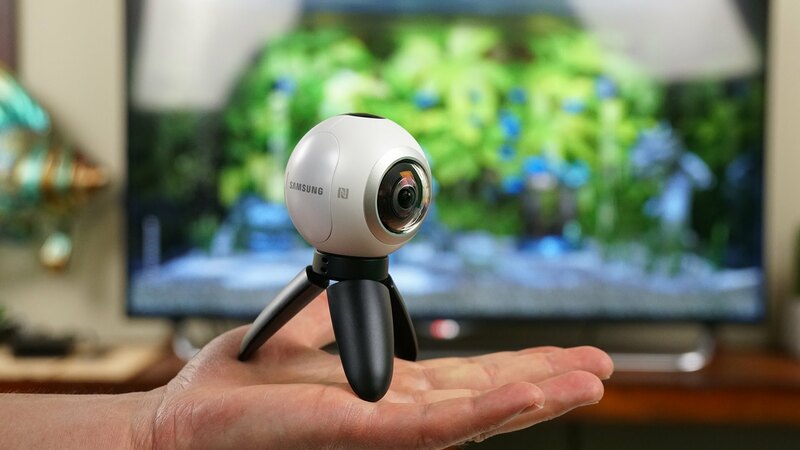 They bring us the Samsung Gear 360, an impressive little dual lens spherical camera. But there might be a worthy competitor. Ricoh is a company that probably isn’t ringing too many bells in your head, but they have a camera that could possibly rival Samsung’s Gear 360. The Theta S. So, enough talking! Lets get into the specs! So, when comparing price tags, they fall within the same area. The Samsung Gear 360 comes in at around 350 dollars, while the Ricoh Theta S goes on Amazon for about 347. A few dollars difference, so the only reason to choose one over the other now will be the cold hard specs. No doubt both of these cameras pack a wallop when it comes to quality, but there is a very clear winner in this department. The Samsung Gear 360 boasts two, 15 Megapixel CMOS Sensors, pretty impressive. The Ricoh Theta S, however, falls short of the Gear 360. The Theta S comes packed with only a single 12 Megapixel camera. Not quite the same, if you ask me. So you may be wondering about the video resolution. The Theta S by Ricoh definitely does the job, recording ‘360’ video at full HD, 1920 by 1080, although at 30 frames per second. The Samsung Gear 360 has some funky format going on, with a video resolution of 3840 x 1920. But, despite the strange sounding resolution, it is technically higher than the Theta S’s. Samsung is obviously doing something right here, but does the Theta ever catch up with the tech giant, Samsung’s, Gear 360? Now, getting into more specific features, I believe the Theta stands out specifically because of it’s ability to stream live video. Thats right, you didn’t read that wrong. While both the Gear 360 and the Theta S have the ability to connect to wifi, the Theta can stream live 360 video over the internet. The Samsung Gear 360 can upload 360 photos directly to Google’s Street View, sure but can it broadcast a 360 view of the sky during a meteor shower. It think not. Theta users also claim that the interface is easy to use, and the small form factor makes for easy shooting. The Gear 360’s design and form factor could be good or bad, really based on personal preference, so decide for yourself which would be easier to use. To conclude, I think you all have a question in your head. “Which one should I buy! ?” Well the answer isn’t simple. If you like streamlined processes as well as design and you are willing to sacrifice some quality, maybe the Theta S is for you. If you need the top of the line and never settle for less, you should steer toward the Gear 360. Both of these cameras is good in its own ways, but based on sheer quality, and the trustworthiness of a well known company, in the ” Ricoh Theta S vs Samsung Gear 360″ debate, I have to choose the Samsung Gear 360.